But your scornful heart is frozen and fast locked up I fear. I am waiting for my answer, my love, what do you say? I have chosen another sweetheart and you I cast aside. Oh, this world is wide and lonesome, if one don’t, why another will. And when poverty will press you, dear, you’ll think of me, I know. And so would my joys be flowing tonight if Nancy was only mine. I fell in love with this song recently and it seemed a perfect fit for this time of year. 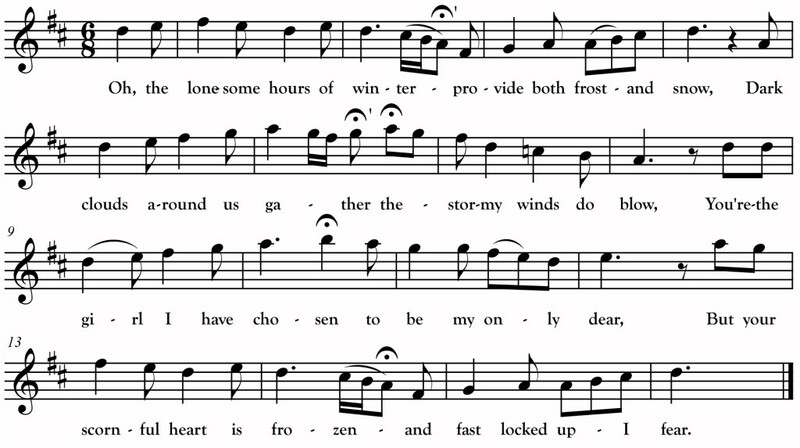 Several versions of this wintery ballad of unrequited love were collected in North America and the song likely originated here as never turned up among singers on other continents. The above text is from Minnesota singer Mike Dean’s songster The Flying Cloud. Unfortunately, Dean’s melody was not (as far as I know) preserved by either recording or transcription. This fall, I was treated to another version of the song, this time from “Yankee” John Galusha of Minerva, New York. The Galusha recordings and transcriptions (made by Anne and Frank Warner and also by Marjorie Lansing Porter) make an especially appropriate cross reference for Dean’s songs as Galusha (1859-1950) was born one year after Dean (1858-1931) on just the other side of the Adirondack Mountains from Dean’s own birthplace. Unlike Dean and Dornan, Galusha wasn’t recorded until he was in his eighties. Still, he approaches the songs with a style not far removed from Dornan’s (and one can only guess what he sounded like in his younger days!). The above melody is my own composite based on recordings of Dornan and Galusha who use variants of the same melody.